Developed in partnership with Argonne National Laboratory. 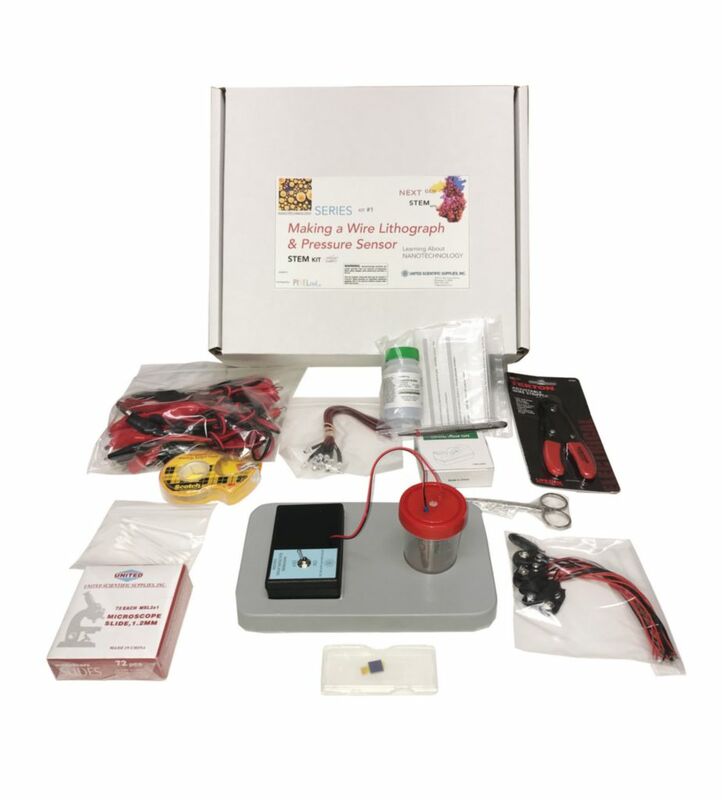 This kit gives your students the opportunity to apply a revolutionary nanotechnology manufacturing technique to grow nano-scale and micro-scale copper wires. Using a unique ultra nanocrystalline diamond (UNCD) electrode, students use traditional electroplating and lithography (E&L) techniques to grow pattern-shaped wires that become the essential components that can be used to fabricate optical and electrical sensors and other devices. This kit covers the following concepts: measurement scales/perspectives, unique properties at nanoscale, fabricating nano/microscale structures, and creating nano/microscale lithographic wire patterns. Students incorporate the UNCD electrode in a traditional electroplating apparatus and apply a 9V potential to electroplate star wire patterns. Depending upon electroplating time (minutes), students create and transfer invisible (nanoscale) or visible (microscale) wires in a star pattern onto sticky tape. In the process they learn directly about scale (nano to macro) scale prospective. Your students observe these wire patterns placed on microscope slides under low (<100X) magnification. They assess how electroplating time (electro deposition) affects wire length (and corresponding wire pattern visibility) and how wire patterns can be consistently produced and reliably transferred onto a flexible support medium (sticky tape). These learned skills form the basis for future student design applications – such as incorporating copper wire lithographs into sensors or creating light diffraction gratings. Students apply their knowledge of nanomanufacturing (E&L) to create nanowire and microwire patterns that can be used to create a pressure sensor. Students learn what a sensor is and use their observational electro-deposition data (from the previous activity) to design, manufacture, and test a conductive ‘bridge’ (pressure ‘sensor’) allowing illumination of a 9V LED lamp. Ordering information: Kit is provided with an access code for downloadable activity guides and other support information, including Teacher Guide; Student Guide; Glossary; Background Information: Learning About Nanotechnology; Videos: Nano Frontiers MP4, Nano Manufacturing: Electroplate and Lift Lithography, Making Nanowires mp4; PowerPoints: Making a Microwire Lithograph ppt / mp4, Nano Technology: A Closer Look at the Universe of ‘little’ ppt/mp4; and Poster: A Closer Look at Nanowires.